So here is my very first SIMPLE START recipe! Ever since I found out about this aspect of the plan a few weeks ago, I've been innovating some great ideas for you in the Slice-of-Slim kitchen, so that once you've got to grips with the selected Filling & Healthy food list in your SIMPLE START booklet, you can really begin to exploit the allowed foods. For this recipe, I've blitzed crumpets in a food processor with quark or yoghurt, some seasoning and herbs from the flavour booster list and hey presto…a really amazing pizza base! Quark isn't the most inspiring ingredient straight from the pot, but if you think of it as a neutral ingredient that you can funk up with simple seasonings and add to recipes, it's really useful - so give it a chance! As the whole ethos behind SIMPLE START is a straightforward approach without the distraction of weighing, measuring or counting, my recipes will have portion guidelines but very little actual measurements unless really necessary. Portion guideline- 2 crumpets, 2 rough tablespoons Quark/yoghurt, 1 egg, 1 teaspoon olive oil makes a average-sized pizza base. Start by tearing the crumpets in half. Pop them in a food processor and blitz until you have chunky breadcrumbs. Add some Quark or yoghurt, egg, seasoning to taste and olive oil. Measure the olive oil as this comes out of your daily allowance. Blitz again until you have a very thick paste. It's not a dough texture as it's quite a wet mixture, so don't attempt to knead it! Spread the mixture onto a baking sheet which has been lined with baking parchment (the white one if you can get it as it can stick to regular baking paper), or I used a teflon sheet. Spread it into a circle using a knife until it's about 1 cm thick. Bake at 200C/400F/Gas6 for about 20 minutes until really crisp and golden on the top. If you like your base really crisp, flip it over and bake for another 10 minutes before adding the toppings. Otherwise, flip over so that the crisp surface is on the bottom, and load up your toppings. …Then spoon cottage cheese generously over the top or dot spoonfuls of Quark around the pizza. Either of these ingredients make a really great mozzarella substitute. You'll find that cottage cheese has a creamy and less sour tang than the Quark. Experiment and see which you prefer…we love both in the SOS house! Bake for a further 10 minutes until the edges of the ham have gone a little bit crispy and the cheese is hot and melty. Scatter with chopped chives or torn basil leaves before serving. Here's one I made using Quark-looks just like mozzarella! Ring the changes by adding different toppings each time you make this-add some fresh tomatoes or mushrooms, pineapple or prawns. You can even blitz fresh herbs, garlic or chilli into the base! You could cut up a cheese slice or 15g parmesan from your EXTRA TREATS and sprinkle over the top for an authentic cheesy flavour. Click HERE to see my YouTube tutorial showing you how to make this pizza! 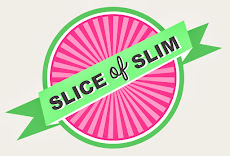 Don't forget to subscribe to the Slice of Slim channel to see future recipe films! Made this tonight. Loaded it up with mushrooms, onion, sweetcorn, peppers and a little chicken. Perfection!